When the weather is a little more mild, it’s totally OK to show a little leg without the opaque tights. I decided to pair the leather shorts with my new velvet blazer for a more tailored look. To offset the somewhat dark and monochromatic ensemble, I added a pop of brighter green with my latest bag acquisition from Rebecca Minkoff. Gold details round everything out! Love the leather shorts and the bag! those shoes are amazing!!! love the look! Ooh this is definitely my favorite (so far) – the colors & textures look so rich together and those sunnies are amazing!! That velvet blazer is gorgeous! Love this look! Cute blazer! I’ve had my eye on the J.Crew version for a while now. Those sunglasses are really unique! Love the mix of the deep green and black, looks awesome very fall. Love this look – you look great! 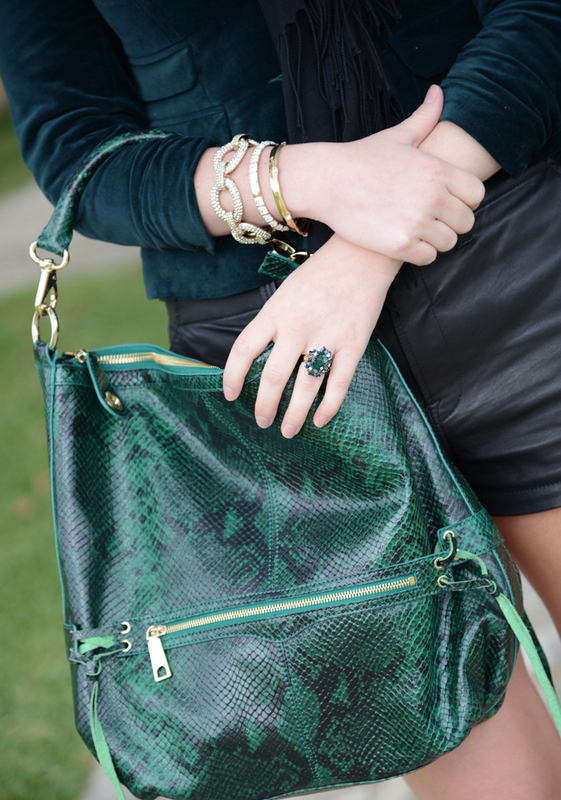 This outfit is gorgeous – I am so in love with the rich green & black combo! So glamorous! And those sunglasses are seriously amazing!